Games Based Learning (GBL) is not a new concept and should be treated as part of training delivery in the digital age (Spector, Ifenthaler, Kinshuk & Isaiasl, 2010). The use of serious digital GBL (SDGBL) to support students is still considered unusual for the Vocational Education and Training (VET) sector and is viewed as an avant-garde innovation. Jasinski (2007) outlines that an innovation process starts with the initial early adoption, moves onto dissemination of the technology (diffusion), reinforces through the usage of the innovation (implementation) and ultimately ends with the underpinning of all mainstream delivery (integrating into core practice). In the 2013 NVELS E-learning Benchmarking Survey (National VET E-Learning Strategy, 2013) 68% of online resources and materials used were being sourced from outside training organisations. What this survey fails to detail is the uptake of GBL, in-particular serious games and digital simulations, to support qualifications at all levels and across a variety of training packages (curriculum) and where any SDGBL being used were sourced from. There is growing evidence that gamification is propelling productivity improvements in a wide variety of commercial sectors and the VET sector needs to leverage the affordances of GBL to support training (Dale, 2015; Vrasidas & Solomou, 2013). It is important to note that SDGBL is a move away from the ‘drill and practice’ behaviouristic methods being employed by some e-learning interactive learning objects that have limited success in supporting students in developing advanced knowledge skills (Brom, Šisler, & Slavík, 2010). For the purpose of this paper there will be a distinction drawn between general gamification and serious games or simulations; what differentiates gamification from commercial off-the-shelf (COTS) games and serious games is that they are built with the intention of a structure that includes elements from games, but are not seen as primarily an entertainment game (Browne, Anand & Gosse, 2014). In the VET sector there has been an increase in the uptake of e-learning across all curriculum areas, but currently there is no strategy or support documentation to aid an RTO or lecturer to implement SDGBL as part of their pedagogical strategy to support student outcomes. The purpose of this paper is to outline methodology for implementation drawn from relevant case studies and research principally related to the VET sector and will break this down into four areas: analysis; choice of software; implementation; and evaluation. One key point for a successful implementation of GBL and SDGBL is the need for planning prior to implementing as gamification needs to be understood by all key stakeholders prior to implementation (Dale, 2014). It is important for organisations and trainers who are moving forward with GBL or SDGBL to have stakeholder buy-in, which includes organisation management (including ICT departments), trainers cohort and industry bodies. Organisations are spoilt with choice for models of implementation of e-learning, many of these can be used as a basis for GBL implementation. The Innovate and integrate Embedding: Innovative Practices report (Jasinski, 2007) details a number of different implementation models being used by the VET sector for e-learning. The Resource, Infrastructure, People, Policies, Learning, Evaluation and Support (RIPPLES) model (Surry, Ensminger & Haab, 2005) was the most prominent model identified and is relatively easy to implement at an organisational level. Van Eck’s (2009) process for implementing DGBL into a learning environment can easily be blended with with the RIPPLES model (Surry, Ensminger & Haab, 2005) or the Technology Integration Planning (TIP) model (Roblyer & Doering, 2013). This is a problem solving model that helps a trainer weigh the affordances of GBL in terms of the technologies use being are meaningful, efficient and successful (Roblyer & Doering, 2013). The implementation of GBL needs to be carefully managed as it is a change management process and as such requires a whole of organisation commitment to the formal process. The essential first step for the successful implementation of GBL, is for organisations to assess the organisational readiness for GBL to be integrated into training programs in the form of a needs assessment of both the organisation and the training curriculum that GBL is envisaged to augment. The needs assessment is a critical analysis that will determine gaps between the current training delivery and the desired outcomes that can be achieve through leveraging the pedagogical benefits of GBL to support training delivery (Hall & Hord, 1987; National VET E-learning Strategy, 2013a; Surry, Ensminger & Haab, 2005). It is imperative that as part of the needs assessment the organisation and trainers develop learner profiles, identify what devices will be used and most importantly identify the assessment strategies that will be employed as this will inform the selection of resources (National VET E-learning Strategy, 2013a; Roblyer & Doering, 2013). Biggs (1996) discussed constructive alignment being a foundation for teachers and trainers to use when creating holistic learning and assessment activities that do not directly link to the curriculum. This is vital to consider when determining, via a needs assessment, implementation of SDGBL into a training program. The choice of SDGBL or simulation can sometimes come down to price, however with simulators such as SimSpray Standard (VRSim, 2012), though the initial outlay is relatively high, the RTO will see long term return on investment as the need for constant physical resources will diminish. Polytechnic West in Western Australia has employed this style of simulation for students in the automotive painting industry as it enables multiple attempts from the student to refine their skills prior to being allowed to paint physical cars. This intrinsic integration, where the learning material is embodied with in the SDGBL or simulation and then the user interacts with the content as part of the game means that the student can apply the learning from “in-game” to real-world scenarios seamlessly meaning an immediate transfer of skills into the workplace (Habgood & Ainsworth, 2011). Trades trainers also have available Sharable Content Object Reference Model (SCORM) interactive learning objects available that are mapped to Australian Training Packages from the National VET E-Learning Strategy (2012). There is a wide variety of serious games available to trade trainers that can be loaded directly into a learning management system which can aid in formative assessment. Though these games provide solid background information it does not provide the tactile learning experiences of a SDGBL or simulation as they lack in-built forms of intrinsic or extrinsic motivation for the students (Habgood & Ainsworth, 2011). However, used in-conjunction with other SDGBL and tactile physical learning experiences these learning objects can also form part of an authentic learning experience, such as learning to quote on jobs accurately. It is vital that a trainer investigates their Technology, Pedagogy and Content Knowledge (TPACK) to ensure that the technology being deployed supports the course, as every situation for implementation will be different (Koehler & Michra, 2009). The selection of GBL resources to augment learning is a critical point in the successful implementation of SDGBL in a training program and it is important to note that the technology used within a classroom is shaped by a trainers beliefs around the technology (O’Brien & Maor, 2013). Bower (2008) outlined an affordance classification system that supports the accurate identification of technology tools to match the affordance requirements to the learning and assessment tasks being undertaken. This is a valuable mechanism that can be employed by organisations and practitioners in the investigation of serious games and simulations that will support learning outcomes. The Bower (2008) framework will also show a gap analysis and with this information the trainer will be able to create additional scaffolding activities to support the students as research by Moore and Pflugfelder (2010), Van Eck (2006), Beavis et al. (2014). Government agencies, who are also Enterprise RTOs, such as the Western Australian Department of Fire and Emergency Services, have expressed an interest in the use of SDGBL to augment their face-to-face training through such software as FLAME-SIM (Flame-Sim, LLC, 2009) – currently used in America to train firefighters because of the authentic nature of the software (Herrington, Reeves & Oliver, 2007). This software enables the trainers to provide a high pressure, full-scale scenario that is tailored to the specific context making it meaningful to the participants (Nicholson, 2012). A large portion of authentic learning within a simulation or SDGBL environment focuses on interaction between concurrent users or team members of various job functions (for example firefighter and incident controller) as they work through a well-controlled and planned simulation to ensure that all team members have the skills and experience in a wide range of scenarios that could be experienced in the field. In this context the live interactions focuses the team members on the importance of effective communication to achieve the desired outcome of the simulation, which will be replicated in a real-life situation should the need arise (Herrington, Reeves & Oliver, 2007; Herrington, Reeves, Oliver & Woo, 2004). With the focus being on effective communication and working as part of the team provides the user both intrinsic motivation – the need to complete their job effectively and extrinsic motivation – the team is depending on how you perform as part of the team. At the end of the gaming session the users debrief and it is there that users find out how well their motivations drove them in the game to achieve the desired outcomes (Habgood & Ainsworth, 2011). Another model that aligns with the Bower (2008) affordance classification system is the TIPS model (Roblyer & Doering, 2013) which steps primarily practitioners through three phases: analysis of learning and teaching needs; planning and integration; post-instruction analysis and revisions. The Brant Skills Centre in Ontario developed two game applications that support Adult literacy. They used primarily the TIPS model to implement three contrasting serious games to support the improvement of basic literacy skills in the participants (Browne, Anand & Gosse, 2014). What came out of this implementation was that the users engaged and learnt more when there was a social aspect to the game, with the users achieving a higher retention rate of understanding and skills transference when they played with a social dynamic. This social dynamic empowers learning experiences and is essential across all learning areas (Vrasidas & Solomou, 2013; Barab et al., 2007), which makes the social dynamic a powerful driver in the research of a SDGBL for training situations. It is always wise to deploy firstly to a pilot group who can evaluate the program and issues arising can be resolved prior to a large scale deployment (National VET E-learning Strategy, 2013a). Simulations and SDGBL allow users to take risks and fail in a safe environment (Kimenkowski, Kimenkowski, & Combes, 2009). Kimberley Institute of Technology went through the implementation process of SDGBL successfully with the establishment of the Broome Maritime Simulation Centre. Prior to the development of the Broome Maritime Simulation Centre students were required to learn primarily in traditional classrooms, which did not adequately prepare them for the rigours of their work placements, and subsequently low number of students achieved adequate results in the work placement final assessment. This was a critical need and the decision was made to build a real-world simulator centre for the maritime training. The Broome Maritime Simulation Centre is equipped with state-of-the-art simulators that train and assess students in maritime emergency situations, safety training and pilotage tug operations along with new port development analysis. This type of simulation supports meaningful learning (Buckingham, 1990; Gee, 2004, 2005) and provides both extrinsic and intrinsic motivation for the students (Conradi, 2015) as well as supports students unique learning pathways (Becker, 2011; Kinzer et al. 2012; Mann, 2001, p 241; Turkay, Hoffman, Kinzer, Chantes & Vicari, 2014) while encompassing different learning styles in hands-on real life simulated experience (Roblyer & Doering, 2013; Herrington, Reeves & Oliver, 2007). The true value of SDGBL comes when students need to use knowledge authentically within a SDGBL and subsequently in a real-world context (O’Brien, 2011). Sometimes the choice of SDGBL or simulations may not always link to the expectations of the organisation, trainer or students. It’s necessary to evaluate the use of SDGBL in programs to ensure that the learner outcomes are being met effectively (National VET E-learning Strategy, 2013a). We assume that all areas are actually learning from the implementation of COTS, serious games and simulations. Macedonia & Rosenbloom (2001) say that maximum verisimilitude of simulations allow for total immersion of military personnel in their training via serious games. Thang (2012) outlines that real-life combat is far more tactical that the COTS games would have the user believe with the blockbuster entertainment being just that, entertainment. 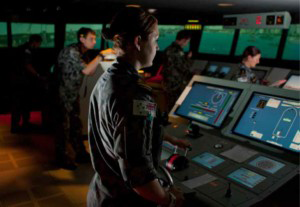 The Royal Australian Navy clearly disagrees with Thang (2012) as a large amount of defence funding was spent in 2011 on the HMAS Watson training facility ship’s bridge simulator upgrade (Kongsberg Maritime, 2011, p. 4-5). This simulator trains cadets in piloting warships, anti-piracy, passage planning and close quarter manoeuvres. 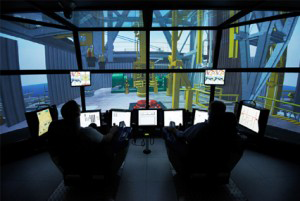 The oil and gas industry in-fact saw a significant need to embed SDGBL simulations into the training as accident reports pointed towards a lack of team communication being a key factor in most critical incidents (Maersk Drilling, 2014). Since the implementation of the simulated training where communication of crew members is a focus, incidents have fallen as they have transferred the skills learnt in the simulator into real-life scenarios, making this a successful immersive learning and assessment task where learning has become a remembered experience (Farmer, 2011; Herrington & Parker, 2013; Herrington, Reeves & Oliver, 2007; Pederson, 2000). Serious games and digital simulations that recreate difficult, hazardous or dangerous working conditions in a three dimensional stereoscopic environment (Wann & Mon-Williams, 1996), which incorporates both single and multiple concurrent users are an important and valid way that VET practitioners can train and assess students. Not only does the serious game digital simulation environment provide a valuable assessment and training pathway, but is also provides a safe environment option to ensure that the students first experience of the task is not in the real-life high risk location (Kimenkowski, Kimenkowski, & Combes, 2009). This safe environment training and assessment situation also allows for authentic real-world learning experiences that would otherwise not have been an option, which is critical for adult learners as it provides an avenue for students to demonstrate mastery levels in a real-world situation (Farmer, 2011; Herrington & Parker, 2013). Serious games and simulations provide industry and education with immersive hands-on active deep learning authentic experiences which are engaging for the learner and helps with the retention of knowledge and the transference of skills due to the active nature of their involvement (Brom, Šisler, & Slavík, 2010; Kimenkowski, Kimenkowski, & Combes, 2009). This is essential for the traditional trades’ areas where e-learning is still on the periphery of uptake in the VET sector (Ryan, 2014; National VET E-Learning Strategy, 2013). The organisations outlined who have successfully implemented SDGBL all worked through the change management process. Each worked through a needs assessment, chose appropriate resources, deployed to a pilot group, evaluated the program, then deployed on larger scale and now SDGBL is integrated into their core practices (Jasinski, 2007). Bower, M. (2008). Affordance analysis—matching learning tasks with learning technologies. Educational Media International, 45(1), 3–15. Conradi, K. (2015). Tapping technology’s potential to motivate readers: technology isn’t inherently motivational to students, but teachers can employ a variety of strategies that can harness technology to promote student engagement. Phi Delta Kappan, 96(3), 54. Dale, S. (2015). Gamification Making work fun, or making fun of work? Business Information Review, 31(2), 82–90. Flame-Sim, LLC. (2009) FLAME-SIM (2.0) [Computer software]. Illinois, Hoffman Estates. Gee, J. P. (2004). 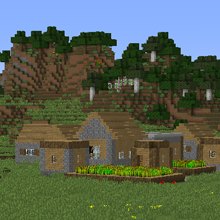 What video games have to teach us about learning and literacy. Palgrave Macmillan. Gee, J. P. (2005). Why video games are good for your soul: Pleasure and learning. Common Ground. Hall, G. E. & Hord, S. M. (1987). Change in schools. SUNY Press, Albany, New York. Jasinski, M. (2007). Innovate and Integrate: Embedding innovative practices report, Australian Flexible Learning Framework. Retrieved from http://flexiblelearning.net.au/wp-content/uploads/Innovate_and_Integrate_Report1.pdf. Pedersen, P. (2000). One in the Eye is Worth Two in the Ear! Simulation Gaming, 31, pp.100. Roblyer, M., & Doering, A. (2013). Integrating educational technology into teaching. Boston: Pearson/Allyn and Bacon Publishers. Surry, D. W., Ensminger, D. C., & Haab, M. (2005). ‘A model for integrating instructional technology into higher education’. British Journal of Educational Technology, 36(2), pp. 327–329. Van Eck, R. (2009). A guide to integrating COTS games into your classroom. In Ferdig, R. (Ed. ), Handbook of Research on Effective Electronic Gaming in Education (pp. 179–199). New York, NY: Information Science Reference.